Last May, when it was getting close to my London to Brighton ultra, I was planning my 2019 run and decided to put a marathon in the programme. I’d failed to start Birmingham the year before – too much going on, not enough headspace for training – so needed to have another in the plan. Having read a lot of good things about Manchester (after they’d sorted out a couple of years with difficulties) I decided that this would be my target. (I had entered the London ballot, but never expected to get in again – and I was right, at least through that method). I booked the marathon, I booked the hotel near to the start and then put it to the back of my mind. I had a half booked in for October, so the plan was to train for that, and then switch to a marathon programme. The brain decided otherwise, not having anything to do with running or walking for 2 months after London-Brighton and even after that, playing games with me and making it really hard to get stuck in to some serious miles. The travel also made things more difficult, especially as it got into the darker nights, as I didn’t know the routes in the same way. Then I also booked the Kili trip for Februaryand was on holiday for most of November. All of this meant that in the 6 months before the marathon, I had run a total of 173 miles (and walked another 164 miles). In contrast, for my first marathon I had run 568 miles in the 6 months training. So I was undertrained, to put it mildly! Never mind…I’m generally stubborn, I know the effort it will need, I decided to go for it. I travelled up to Manchester on the Saturday and made my way to the hotel. The first thing to check was the distance to my start pen, so back out I went and timed the walk as 8 minutes. Lovely, plenty of time to sort myself out in the morning. The a meal of pasta before an early night. Breakfast was from 6 – usually, it only started at 7:30 at the weekends, but given the number of runners staying, they’d made provision. Coffee and food sorted, it was back to the room to rest for a couple of hours before I needed to move. One short walk later, I joined the crowds. This was probably the worst organised start I’d experiences. Although the information sent out beforehand had clear maps and the pens were clearly marked at the front, there was other structure to the pen apart from a lead barrier to separate then for the different start times. There were no barriers around the groups and no checking you were in the right groups, although the instructions had implied there would be and the pens would close 20 mins before the start time. I could have stayed in the hotel an extra 30 mins and just wandered up for the start! Eventually, the horn went, the elites started off and the pens slowly made their way to the front I was in pen G, so by the time we started moving, the first group where heading back towards us to start their mile 3. I’d finally decided on my race plan. My initial plans were to do a run-walk race, but I knew I could do a half marathon steadily without stopping, and I knew there were plenty of water stations I’d want to walk through to make sure I got gels and water onboard. So I decided on a mixed strategy of running at least the 1st half and then switch to run walk after that; I though this would be the best strategy. The 5:30 pacer later passed me, having obviously done run walk from the start, however I think the run pace would have been just over what I was comfortable with, having done almost no speed training. The target was 5:45, which meant I had to average 13:10 per mile – giving a pretty good buffer for the massive slowdown I knew I would get in the latter stages. Off I went, slow and steady at my “usual” pace, which is just under 12 minute miles. We first head north east into the city along a dual carriageway before swinging round a loop back to the start area in mile 3. The weather was perfect, overcast, cool, with a breeze, and the course was flat. it was easy to get into a rhythm. Now heading out of the city, I passed by the first water station – nothing needed yet, but took the first gel at 4 miles. By this point, the relay racers were starting to catch us up. In teams of 2 or 4, they were a lot faster than many, especially later in the race, but luckily all had Relay notices on their back so you didn’t feel too bad when they passed you! My pace was being maintained, even with a very quick walk break at mile 6. We were now in Sale, continuing to head out into to the suburbs and then onto the country. Every “centre” had a good crowd, often with music. Timperley, at mile 10 was particularly memorable, a lot of people, a commentator outside a pub and music. Everytime you passed these groupings, you definitely sped up! I carried on, reaching Altrincham, the turn round point. Mile 12 was my first slower one, with a water break and the only real hill on the course in the town centre. The turn round point and we headed back into town, first the way we came and then swinging west to head further out. So far, I was keeping a steady pace, miles 13, 14 and 15 were all at the quicker pace – I’d managed more than the target 13 miles at my “race” pace, now it started to hurt, dropping into 13+ minute miles. My legs felt not too bad, just tired, except for hips, which had been giving a lot of trouble in the weeks before the race, feeling tight. They started to give me a little pain, but not enough to interrupt the slide. Miles 18 to 23 definitely felt they were out in the country. There was support, but not consistent, often large stretches without any one (it was also late in the race, so there are never as many). I’d now settled into a new run-walk routine. From each mile marker, walk 0.1 of a mile, run half a mile, walk 0.1 of a mile, run to the next mile marker. If the signs to the water station were showing it was close to my next walk break, (they were signposted 400m out) then just keep running until then and walk through the water station to take on the drink. This routine kept me going, and gave my mind something to do. Finally, there was just a parkrun to do (I looked for a sign, there is often one, but did not see anything). Everything was slowing down further and my hips were getting worse, mainly the right side (the usual bad one). More and more people were stopping to stretch out, but luckily, I was not hit by cramp and could keep moving forward, it was just uncomfortable. There was no speed in the legs now and I wasn’t even tempted to try and keep up with the 5:30 pacer. 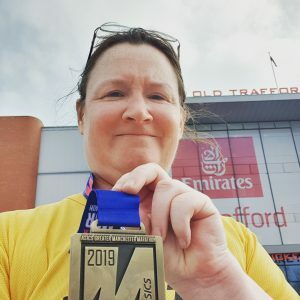 I knew I could finish, and it was just a matter of keeping going – which means the brain slightly switched off and I spent a little longer walking, especially up any slight rise! Turning the last corner, you could see the finish – about half a mile ahead. A bit more at a walk and then time to gather everything together and head for the line. The crowd was still massive around this section and there were plenty of cheers and encouragement, especially helpful as the finish took a long time to get to! And I was done! With a time of 5:36, my 2nd fastest time out of the 4 I have done, which was really pleasing. Overall, I felt not too bad, far better than the previous two. Although I had no speed, the walk training and the mountain training had definitely helped my overall stamina, so I knew that the distance was doable. Time to pick up the medal, the maltloaf and the beer! Well, Erdinger Alkoholfrei, which appears to be marketed as an isotonic drink therefore should be perfect for after a marathon!!! It was fine for sipping as I wandered back to the hotel. 25 minutes after finishing, I was in the shower, stretching, before food and a welcome glass of wine. Definitely good having a hotel so close. Manchester marathon is a great marathon. Well supported, a good course, great marshalls and well organised (except for the start pens). I full recommend having a go – especially if you’re a fast one as it’s actually pretty flat. They’d upped the numbers this year to 20k, so it’s one of the largest in Europe and I think they’re going to keep seeing how they can grow it. This entry was posted in running by Rachel. Bookmark the permalink.